On March 10, 1849, Abraham Lincoln filed a patent for a device for "buoying vessels over shoals" with the US Patent Office. Patent No. 6,469 was approved two months later, giving Abraham Lincoln the honor of being the only US president to hold a patent. During his brief experience as a ferryman on the Mississippi River, Lincoln was stranded twice on riverboats that had run aground. His invention, "adjustable buoyant air chambers," would be attached to the sides of a boat. They could be lowered into the water and inflated to lift the boat over obstructions in the water. Lincoln whittled the scale patent model while Walter Davis, a Springfield mechanic, provided tools and advice. The device was never produced for practical use and doubts remain as to whether it would have been a useful invention due to the amount of force needed to lower and fill the air chambers. 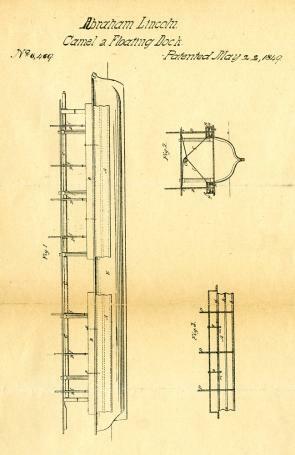 Be it known that I, Abraham Lincoln, of Springfield, in the County of Sangamon, in the State of Illinois, have invented a new and improved manner of combining adjustable buoyant air chambers with a steamboat or other vessel for the purpose of enabling their draught of water to be readily lessened to enable them to pass over bars, or through shallow water, without discharging their cargoes; and I do hereby declare the following to be a full, clear, and exact description thereof, reference being had to the accompanying drawings making a part of this specification. Why is the patent process so important that it appears in Article 1, Section 8 of the United States Constitution? Describe the problem that Abraham Lincoln’s patent design was meant to solve. What does this application tell us about Lincoln’s education and life experiences? Explain why travel by “steamboat or other vessel” was so critical in 1849.